The first mining camp in this area was known as Camp Salvado, named for a group of Salvadorians working the placers. It was located on a flat at the top of Shawmut Grade, less than one mile east of present Chinese Camp. In 1849, some thirty-five Cantonese miners arrived at Camp Salvado and began prospecting. Where they came from is somewhat of a mystery; some say that a ship’s captain left his vessel in San Francisco Bay, bringing his entire crew with him to the mines; another version claims they were employed to search for gold by a group of English speculators. No matter where they came from, what they found when they arrived was gold. The claims were rich. Rich claims attract miners. Within no time large numbers of white miners arrived at Camp Salvado, eventually pushing the Chinese out. Ironically, the American camp known as either Washingtonville or Camp Washington, located opposite of Rocky Hill from Camp Salvado, accepted the outcast Chinese miners without problems. Camp Washington proved to be a rich one and soon became home to a large number of celestial miners. After being driven away from other diggings, or having just arrived in the country, the Chinese miners gravitated here, feeling safe and comfortable among others of their nationality. The lack of water in the area, needed for working the placers, may be one reason why the Chinese were able to establish a successful camp without much interference from the white miners. Being more patient and industrious than their American counterparts, the Chinese miners were willing to work harder and for less return than the white miners, often making good wages on claims abandoned by other miners. The mines in this vicinity were principally surface diggings, with the gold being diffused throughout the entire surface. Hilltops as well as gulches paid good wages. The problem was the gold-bearing dirt had to be hauled to a creek on the Sims Ranch, or still farther, to Six Bit Gulch in order to be washed. This was a lot of work. Eventually ditches and flumes were built across Montezuma Flat, bringing in water from Woods Creek and a new influx of miners to search for gold. The camp continued to grow, and due to the large number of Chinese inhabitants, became known by such names as Chinee, Chinese Diggins, and Chinese Camp. When the post office was established on April 18 of 1854, the town became officially known as Chinese Camp. The only reminder of its earlier cognomen, Camp Washington, lies in the road Washington Street. The town’s location made Chinese Camp the center of transportation for a large area, several stage and freight lines made regular daily stops here on their way to other points. During the mid-1850’s, an estimated three to five thousand inhabitants lived in the area and the camp boasted several stores, hotels, joss houses, blacksmiths, a church, a bank, a Wells Fargo office, a Masonic Lodge, and the Sons of Temperance. Four of the famous Chinese "Six Companies" had their agents in town. The placer mines of this area are credited with producing $2.5 million in gold. Chinese Camp was the outfitting headquarters for the notorious “Chinese War” which occurred nearby on September 26th, 1856. A minor incident apparently led to the conflict. Reports claim that six members of the Yan-Wo Tong were working a mining claim near a group of twelve men from the Sam-Yap Tong when a huge boulder rolled from one property onto the other. Words were exchanged, threats veiled and unveiled, and blows struck. In order to settle the matter with honor, it was decided the two tongs would meet on the battlefield. Weapons would be needed. Every blacksmith in the area was called upon to create the pikes, daggers, and tridents needed for the coming confrontation. A few firearms were also obtained. On the morning of September 26th, some nine hundred members of the Yan-Wo Tong left Chinese Camp to meet twelve hundred members of the Sam-Yap Tong at a site near Crimea House on the La Grange Road. There, amidst the beating of gongs, the screams of the wounded, and the occasional pistol shot, the battle took place, immensely enjoyed by cheering miners betting on the event. American lawmen broke up the battle before too many casualties occurred, supposedly arresting several hundred of the combatants. When it was over, four men lay dead and four men were wounded. But honor had been restored. Somnolent, over-grown with wild grass and the ever-present Ailanthus trees (the Chinese “Trees of Heaven”), Chinese Camp little resembles its former self, many of its original buildings gone and forgotten. Even the piles of stones which once marked the numerous diggings are disappearing, sinking back into the fields from which they were taken, discarded for the metal, gold. However, two of the Southern Mines most unique buildings are here, along with several other points of interest. Chinese Camp is located directly on Hwy 49. Many people often speed right by, perhaps noticing the stone monument near the side of the road if they are lucky, thereby considering themselves visitors to Chines Camp. I'm afraid that won't do. Author says, slow down and turn onto Main Street. Wander about the old camp and imagine yourself walking those same streets 150 years ago. The Post Office Building was erected in 1854 and first housed Timothy McAdams’ general store, after which it served as the post office for many years. This cool building was made of stone with a brick front for looks and was one of the few post offices in the state which had outside boxes for public use. A plaque on the right side of the building honors Eddie Webb, one of the last stagecoach drivers to roll through town. The Rosenblohm Store is located a few paces down from the post office. Completed in 1851, it was one of the first substantial buildings put up in town, replacing a canvas and wood-frame structure. Built of stone and adobe, the brick front was added in 1854 to spruce up its appearance. The iron doors, which are original equipment, were closed each night to prevent flames from spreading inside in case of fire. Various Stone Ruins are scattered along Main Street, walls defying time remain standing and stone foundations mark the sites of once prosperous businesses. Depressions locate basement sites of long since vanished habitats, while ancient stone walls peek from behind wooden facades, providing mute evidence to their longevity. A few slabs of marble still form part of the raised sidewalks, hinting at the prominence this town once knew. The C.O. Drew Home stands on the corner of Hwy 49 and Main Street. Built in the 1880s, the two-story edifice is the town’s largest remaining structure from the 1800s. Although it appears to have been constructed with stone blocks, the true building material (locally made brick) can be seen where the outside coating has chipped or fallen away. St. Xavier’s Catholic Church was the first non-Chinese house of worship in Chinese Camp. Built in 1855 by popular subscription of funds and labor, the structure originally had a shingle roof which was replaced with sheet iron and several coats of paint when the building was restored in 1949. 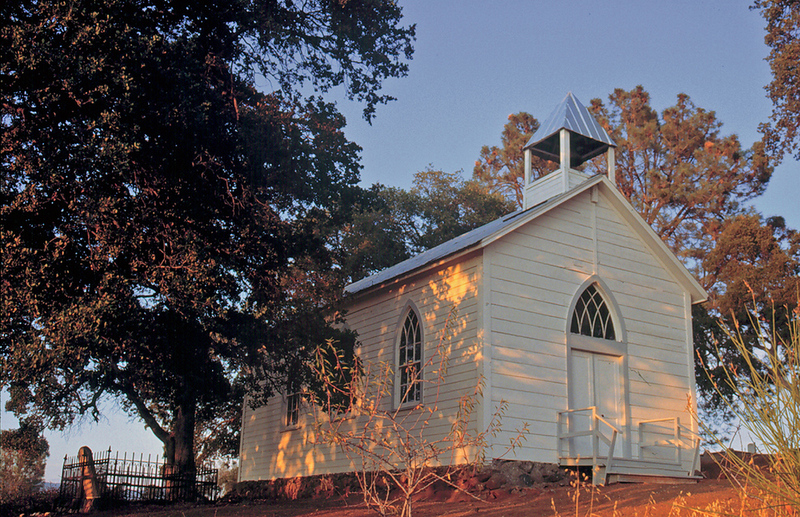 Father Henry Aleric was the first priest to serve the seventy parishioners at Chinese Camp. He traveled a circuit through the mines, covering an area stretching from Knights Ferry to Second Garrote. He rode a mule. The church is located on a hill across the highway. The Cemetery which surrounds St. Xavier is dotted with tombstones in varying stages of preservation. Dating from the early days of the Gold Rush to present times, this old cemetery tells its silent story in granite and marble verse.